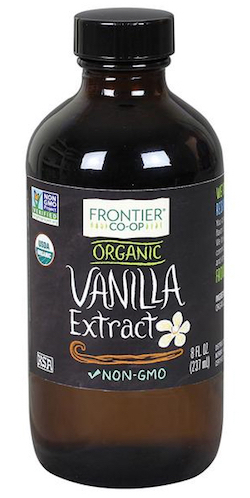 Frontier Natural Products Organic Vanilla Extract 8 oz. Organic Vanilla Extract is made from the Bourbon variety of vanilla beans and has no added sugar. Buttery smooth, extra-sweet flavor and subtle floral notes make this vanilla extract great for desserts and sauces. But don't stop there - vanilla is also now commonly used in smoothies, savory dishes and even DIY home care. Ingredients: Water, alcohol, vanilla bean extract.